Gypsy Scholar: A new young novelist . . .
A new young novelist . . .
"Oh, Miss Austen told us that we could watch a movie during the last block today, since we finished our tests." "What did she say we're watching?" I asked. "I hope it's not anything scary. Last time when we watched one of the Goosebumps series I couldn't sleep at all that night." "This one, unfortunately, will be pretty creepy, Soo. We're watching Coraline -- you know, the one with the spider witch who kills children by plucking their eyes out of their sockets and sewing button eyes." "Oh, that movie. You know, when I watched Coraline, I was seven, and I pulled out all the buttons from my clothes and buried them in the park near my house." I laughed as I fingered the buttons on my cardigan. "But you have to admit, the movie is really creepy for a children's movie." "I suppose it is scary for a seven-year-old," Shin-me said grinning. "Anyway, it's going to start soon. Let's go quickly before the others take all the chips -- the teacher said she bought them for us." I sat next to Shin-me and Jaemi, with Yu Yeon and Seok-Joon sitting in front of us. The movie started with the unforgettable scene of a witch who was stitching a cursed doll and removing its button eyes. The background music seemed more eerie than the scenes, although the scenes were plenty creepy. Coraline, with her short blue hair and muddy yellow raincoat, had moved into a new house. She had been exploring it when she found a small door -- oh, wait, before that, she had received a doll that was supposedly from a boy named Whiney. The doll gave me the creeps because of the button eyes. The doll kept on disappearing, moving by itself, a spy for the witch. Coraline found a small door and went inside at night, when she noticed a group of mice heading in that direction. She found herself in the same house, only with different parents. When Coraline saw her fake mother, the witch, the camera zoomed to her button eyes, which made everyone gasp quietly. The witch kept on making Coraline want to come back by using treats and other things that she had always wanted. Later, when Coraline wanted to go back to her real world, the witch grew angry, refusing to let her leave, and Coraline finally discovered that she was actually a horrifying witch. The story went on like that with gruesome scenes that made us shiver. Occasionally, Yu Yeon would let out a squeal, while the rest of us shushed her. Yu Yeon wasn't scared easily, but she often overreacted. Anyway, Coraline realizes that the witch had been keeping watch on her through the doll's blue button eyes. She then happens to meet three ghosts, the spirits of earlier victims, and becomes determined to battle the witch to save her parents, whom the witch had also managed to trap. "The witch is really hideous," Shin-me said under her breath during the movie. When the witch came out with her dangly legs, horrible face, and creepy buttons, Miss Austen said, jokingly of course, "Aren't you glad that your mother isn't . . . crazy like that?" Miss Austen had a great sense of humor and knew exactly what would make us laugh. Coraline fought the witch with Whiney's cat, which scratched out the witch's button eyes. I thought she looked much better without the buttons. Later, even when Coraline frees her parents and takes them back to the real world, the witch's hand, which Coraline cut off by closing the magical door, follows her and fights her even to the very end. Then Whiney comes to the rescue and crushes the wriggly hand with a rock. As I said, quite well-written . . . and entirely unexpected from a sixth-grader whose first language is Korean! The book went on sale a couple of weeks ago and has sold 30 copies already, by word of mouth, I reckon. By the way, the movie described by Soo Young Yun is a real film, one based on a scary children's book of the same title by the fantasy-horror writer Neil Gaiman. I've not seen the film, but the book is frightening enough. But today's post isn't about Coraline. 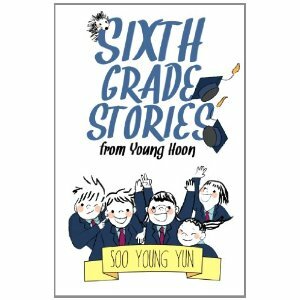 It's on Sixth Grade Stories from Young Hoon, and it must be the novel's first review, so let me say that I think the book would appeal to children from the fifth grade and up, as well as to couples with kids, and to anyone who was once upon a time a sixth-grader and is curious about how Korean schoolkids experience elementary school. I should note, however, that the school described in the book -- which is composed of fictionalized stories from Soo's real school -- is rather unusual, offering half the classes in Korean, the other half in English, a pedagogical experience unlike what most readers will have undergone, and certainly different from my own. But readers will find much to identify with. Very impressive, indeed. I wonder how she learned to speak and write such good English. The other day I met a 9 y.o. Korean boy whose English was so good I took it for granted that he must have lived and studied abroad. Nope, his mother said. Never. No hagwon of course, as the majority of them don't teach English, just collect money. No tutors. No study books. No dictionaries. Just Disney Channel cartoons and English audio books day by day, ever since he was a toddler. That's it. The boy's dad speaks no English whatsoever, and his mom's English can't even match her son's. A clever mother. The street kids in many Asian countries also speak great English, grammatically far better than the most skilled Korean Hagwon students'. Hispanic convicts in American prisons speak fluent English after a few years of imprisonment. Polyglots study languages intensively using their own methods. As for me, the majority of English teachers in Korea are redundant, as are English academies. They just hurt the poor kids with their insane and utterly incomprehensible fascination for studying grammar, boring study books etc. Koreans certainly use the wrong methods for language learning since they study so many years with so little benefit. But Koreans aren't as uncomprehending as the Chinese man many decades ago who was teaching himself English by memorizing the Oxford English Dictionary. He had learned a lot, he believed, so he offered English lessons, advertising his services in a newspaper ad that read: "I am willing to instruct in English. I have been memorizing the dictionary and have gotten to the letter M."
Kid's a genius! I can't imagine myself, as an English-speaker, writing in perfectly fluent literary French at age eleven. Hats off to this ggoma. Her mother will be happy to hear your praise, Kevin. So will the author, too. "Anyone who hates babies and dogs . . ."
The Eternal Coatman's Snicker . . .
Russia: "the scowl that melts into a smile . . ."
En-Uk's Art Blog: "Bird" and "Fish Tree"! The 'Organ' of Sentences . . .